This paper explores the potentialities and limitations of Computer-Based Testing (CBT) compared to traditional Paper-Based Testing (PBT). The aim is to verify whether, and to what extent, an electronic mode of assessment can become a suitable alternative to PBT, allowing the evaluation process to be managed more efficiently, especially within large higher education classes. 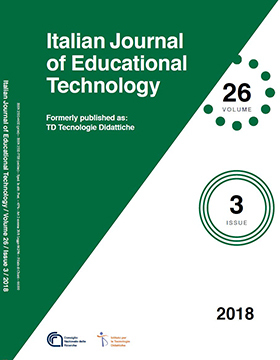 The paper reports a study carried out at the University of Florence in 2016-17 involving 606 students, 443 of whom opted for CBT using their own devices, while 163 preferred PBT. Three hundred and seventy-two participants who experienced CBT also answered a questionnaire on their perceptions, preferences, and level of satisfaction. The results show that the students responded very positively to the digital system, especially the possibility to receive immediate feedback. Some critical issues emerged relating to on-screen reading, which suggests the need for careful design of testing tools. He, J., & Freeman, L. A. (2010). Are men more technology-oriented than women? The role of gender on the development of general computer self-efficacy of college students. Journal of Information Systems Education, 21(2), 203-212. Way, W.D., Davis, L.L., Keng, L., & Strain-Seymour, E. (2016). From standardization to personalization: The comparability of scores based on different testing conditions, modes, and devices. In F. Drasgow (Ed. ), Technology in testing: Improving educational and psychological measurement, Vol 2. Abingdon, UK: Routledge.